Tely 10 2019 iTAB - Deadline to purchase iTAB ($10) is Monday, August 5. 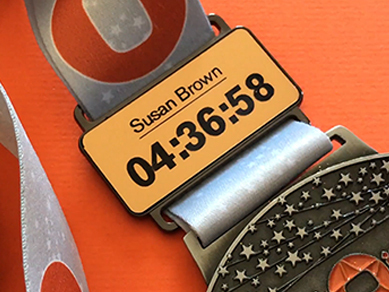 Make it a race to remember by personalizing your medal with your name and finish time. Collect your medal at the finish line and your iTAB will arrive in the mail a few days later. The iTAB fits neatly and securely onto your medals ribbon and is a perfect way to celebrate and share your achievements. The iTAB will be mailed out approximately three weeks after the race. For those of you that have already purchased the iTAB it will be mailed to the address you provided on your registration. You can expect your iTAB to arrive within a 2 to 3 week period after Monday, August 5, 2019. Not sure if you have ordered the iTAB already? Refer back to your confirmation email which you received after registering for the race. The purchase of the iTAB will show up in this email and verify if you have already purchased or not. In order to purchase the iTAB you must return to the confirmation email you received when registering for the race. This email will show an option to modify your registration. Clicking the modifying option will allow you to additionally purchase the iTAB. Please note! The last day to make this purchase will be Monday, August 5, 2019 . You will be asked to re-enter credit card information for payment of the iTAB. Expect 2 to 3 weeks for the arrival of the iTAB.